Beaducation: The Blog: We love aluminum! We get a lot of questions each week about Aluminum. Can you tumble it? Does it scratch easily? Does it bend because aluminum is so soft? Does it stamp all the way through? We have tested it all and can confidently say that we LOVE working with aluminum! Yes, you can tumble Aluminum. In fact, we threw 15 different shapes in the tumbler last week with a couple drops of Shine Brite and forgot about them for more than two hours. When we took them out, the edges were smoothed out and they were brilliantly shiny! Our Aluminum Blanks do not bend easily. They are 18 gauge because we didn't want them to be flimsy. They are super soft for stamping and the impressions darken perfectly with a Sharpie. For any of you who have stamped on Nickel Silver and find it a little tough, aluminum is easy to stamp and you will be able to get even impressions. And don't worry about stamping all the way through the metal since it is 18 gauge. 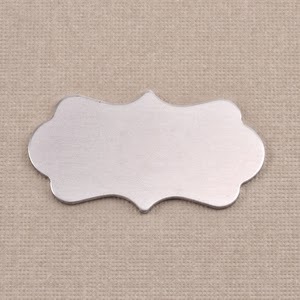 Aluminum can scratch, just as Sterling Silver does if your pendant is rubbing up against another blank, but you can apply a coat of Renaissance Wax or a couple coats of Jewelry Shield to eliminate that problem. You can also give your aluminum a beautiful matte finish by buffing it with Steel Wool. Then you won't have a scratch or fingerprint in sight! 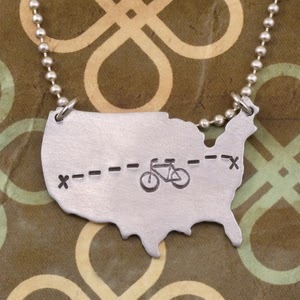 When it comes down to it, aluminum is a great base metal alternative to sterling silver. Typically folks have no allergic reaction to this metal and you will not have the tarnishing problem that you may with Nickel Silver. It is comfortably lightweight and has a thick, expensive look to it. 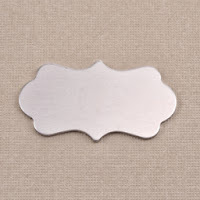 Our favorite part is that you can purchase a Sterling Silver Large Mod Plaque Blank like the one pictured up top for $9.55 and still have enough cash to pick up the same blank in aluminum for just 70 cents! So try aluminum out. What do you have to lose? I am trying to use some small melted aluminum piece's from a friends house fire to make a memorial art piece. How can I polish them if I don't have a tumbler? What is the best way to keep the shine after the piece is finished. I have never worked with aluminum. Thanks for your assistance. Hi Svenska, What a powerful gift. Take a look at our November 6, 2014 Blog Post, Starting from Scratch with Aluminum, for an example of removing scratches and polishing with increasingly fine grit sand papers and then pro polish pads. You can also use fine steel wool all over for a satin finish. Aluminum generally doesn't darken with tarnish the way copper or sterling silver does. But if you want to lock in a shiny look, there are a variety of different types of sealants / protective coatings you can try. We carry Renaissance Wax and Metal Glaze, but there are also clear coat sprays available at hardware stores.